If you follow along with my Events page, then you know this past weekend I had two fairs: First Friday at the 25th Street Collective and Jack of all Trades in Jack London Square (both in Oakland.) Both events were great fun. I always love meeting new people at these fairs, and courting new customers! The display pictured above is from my Jack of all Trades booth. Part of my display from First Friday. This last week I also finished up taking photos for my next collection. Above is an outtake from my second photo shoot for my spring/summer collection. I can't wait to release all of these new pieces officially! It's really been warming up here in Oakland these last few days. Flowers are blooming everywhere and their gorgeousness simply makes me pause. Above, periwinkle in my backyard. 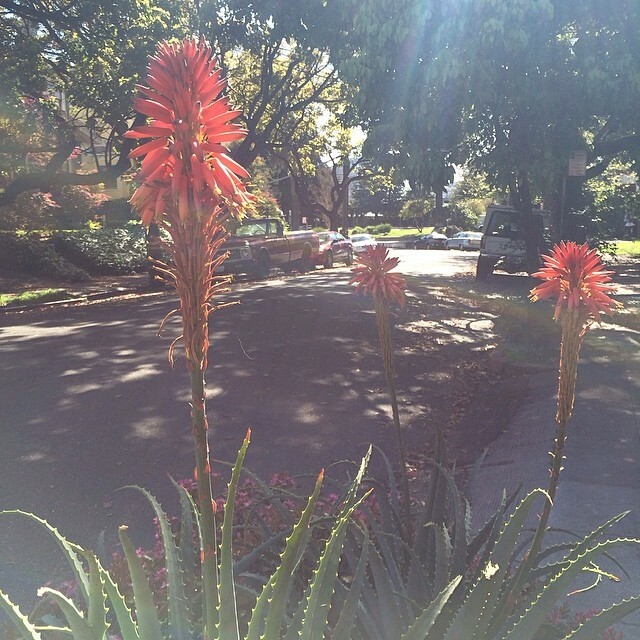 A flowering aloe on my afternoon walk. I took some time on Sunday to re-pot some of my indoor plants. This succulent got a new home in the pot pictured. I found it at a Goodwill a couple of weeks ago. Lastly, some handmade components that went into orders that shipped out last week. I've gotta get dinner finished up for the family. I hope everyone is having a great start to this new week!